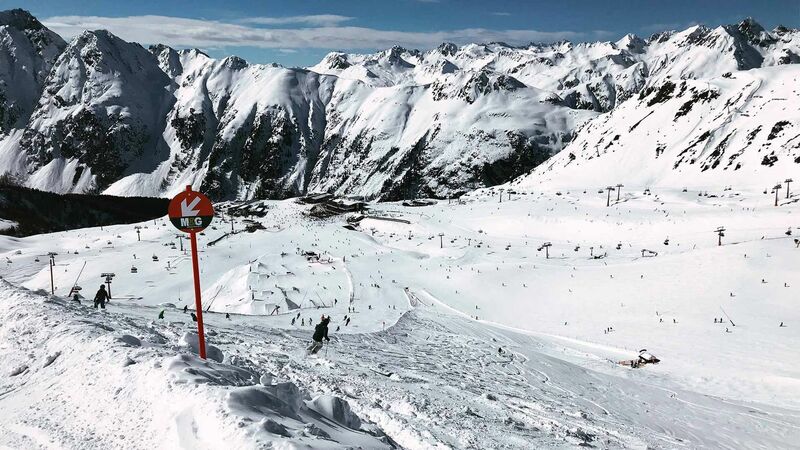 One of the biggest (and growing) names in Alpine skiing, Ischgl is known for its après ski and celebrity visits. For skiers and boarders in the know, these trappings are an irrelevance. Ischgl is thronged with après skiers from mid-afternoon onwards and the resort is adorned with posters of celebrities and musicians who open and close the season. Off the slopes, Ischgl is absolutely in a league of its own. But these visitor add-ons shouldn’t dilute the ski / snowboard product that Ischgl offers, which is one of the very best in the Alps. The lift system is unrivalled, it is modern and extensive, and it seems there is little fanfare needed when a new, high capacity, heated lift is installed. There really can't be a better spec lift system in the Alps. Standing at Idalp, viewing the lifts heading off in all directions, the scale of the Ischgl ski area really becomes apparent. The real beauty of Ischgl though is a combination of geography and lift planning. Between the Palinkopf and Greitspitz peaks, there is a vast bowl of steep off-piste pitches that on powder days serve up sensational descents. Pistes access traverses into the steeps, whilst piste blue 22 is effectively a service road to the lower pistes, or used properly, a launch pad for some moderately steep off-piste routes. Black Variante 20 is one of the steepest pistes in the area but traversing out of the top section, there is a whole world of powder on offer. Even beneath the lifts there are sections of off-piste that can be easily accessed and exited from the pistes. Black piste 14A Greitspitz is a much used piste, but just south of it lies some seriously good and challenging terrain that is often off the radar. The beauty is that in this natural bowl, the riches are clearly visible, as are entry and exit points. And this section is just one of very many, offering sensational off-piste terrain. Areas leading to Fimbatal and Velilbach are heavenly in fresh snow, offering rugged terrain, blanketed in fresh snow. So, whilst there may be world beating après ski action awaiting the masses arriving on the resort pistes, mid-afternoon, the truth is, Ischgl is just about untouchable after fresh snow, high above the roofs of the Kuhstall and Trofana Alm. 01/10/2018 On sale today, the Tirol Snow Card - 227 days of skiing in 90+ resorts for €3.50 a day.